I flipped out when Purdue announced their new head coach. On December 5th, 2012, the Boilermakers hired Darrell Hazell, a coach with a grand total of two years head coaching experience. 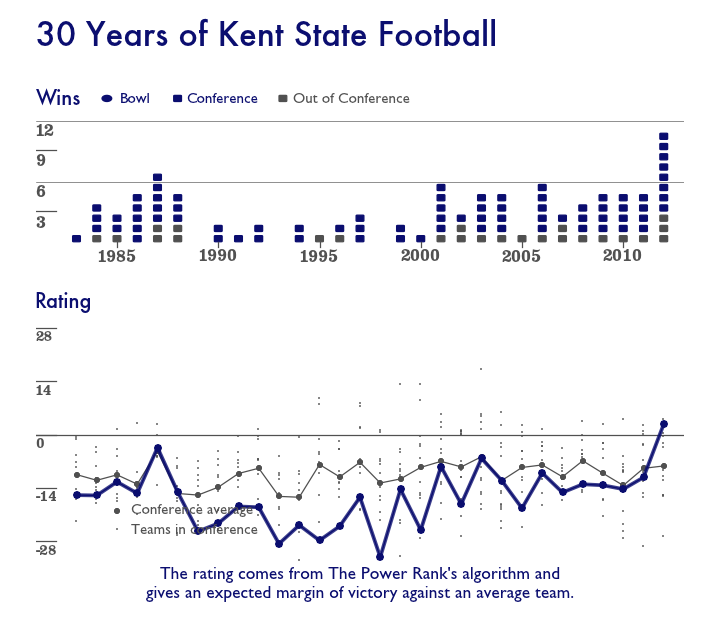 His first season at Kent State (2011) followed their historic trend as a slightly below average MAC team, as you can see in the visual. In his second season (2012), Hazell seemed to turn Kent State around. They had a Disney World season, a fantasy in which they were 11-1 heading into the MAC championship game. With a win over Northern Illinois, Kent State could have made a BCS bowl game. The Power Rank rated them better than the average FBS team, the first time for this program in the last 30 years. However, a big factor in their success was turnover margin. Kent State had 20 more takeaways than giveaways, 3rd best in the nation in 2012. But turnover margin from year to year is like flipping a coin. A team’s value one season only explains 3% of the variance in turnover margin the following season. Turnover margin regresses strongly to the mean. Darrell Hazell got lucky his second season at Kent State with this large turnover margin, especially during their 11-1 regular season. They were only +1 in turnover margin against Northern Illinois in the MAC championship game and lost. They couldn’t force any turnovers against Arkansas State in the GoDaddy.com Bowl, losing that game as well. Purdue, while quite the academic institution with its stellar engineering programs, didn’t get the memo about the randomness of turnovers. They hired Hazell as coach. Did Hazell know he got lucky? The Big Ten held its annual media days this week in Chicago. Every head coach gets 15 minutes in front of the media to make an opening statement and take questions. Except for Ohio State’s Urban Meyer, the questions from the media did not fill the entire 15 minutes, making for an awkward silence. There was a lot of coach speak in his reply: “That’s probably the number one component to losing football games is turning the football over.” Blah, blah, blah. “We have a great responsibility to Purdue football to take care of the football.” Blah, blah, blah. But he never took credit for Kent State’s remarkable turnover margin last season. I’m giving him the benefit of the doubt. I think he understands the randomness of turnovers. There’s hope for Purdue football. From someone who has heard him and his staff speak at length at the Indiana Football Coaches Association convention: they are not stupid, and you are probably correct that he/they feel lucky to be in the B1G and understand that it was a fluke. Also, he did not take most of his staff with him from Kent State and hired the best staff possible (see John Shoop from UNC as QB coach/OC et al).